China has built + tested the world’s first robotic, partially submersible boat equipped with a robust system for launching sounding rockets — a technology used by weather scientists (called meteorologists) to better understand the atmosphere over our planet’s oceans. These tests were conducted in years 2017 + 2018 — and published in 2019. Essential to environmental knowledge + forecasting. Weather researchers struggle to study 3/4 of the Earth’s atmosphere located over the oceans. Crew must travel by airplane or ships, deep into aquatic environments difficult to access. These types of expeditions are treacherous + expensive — plus the mission’s opportunities to gather data can be ruined by stormy seas. Scientists also use buoys or satellites, but these aren’t easy to install over vast stretches of ocean. So sounding rockets are superior scientific tools: gathering data that’s reliable and not patchy. China’s experiment shows advanced capabilities: navigating hostile marine environments, robotically. And autonomously deploying rockets on-target to complete science missions — in places too dangerous or impassable for human teams to go. The power of automation + robotics on display. This combination of un-manned sea travel — plus a complex, remotely-managed rocket launch — is a clear demonstration of what’s to come. China’s successful test heralds a new era of at-a-distance robotics: with applications in defense, search + rescue, exploration, off-shore drilling, ocean fleet management, environmental protection, and a variety of command-and-control systems. The test is a non-trivial display of the power of automation. The robotic vessel carried extensive electronic instrumentation, requiring high levels of co-ordination + expertise by remote human operators. Since the crew isn’t physically there on-location: designers of enormous, computerized, mechanical systems of the future can train teams of engineers who won’t be limited by environmental hazard or distance. The un-manned ship and its rocket system. The ship launched a key tool in weather research called sounding rockets. These rockets make brief flights through different layers of Earth’s atmosphere, carrying meteorological equipment as high as 5 miles above the ocean — higher than weather balloons. Scientific instruments carried by the rockets make real-time measurements of the sea surface temperature — plus profiles of pressure, humidity, wind speed + wind direction. Their plan is to dispatch a network of these boats to study typhoons — and equip the vessels with different ocean sensors. Artist’s drawing of a sounding rocket. 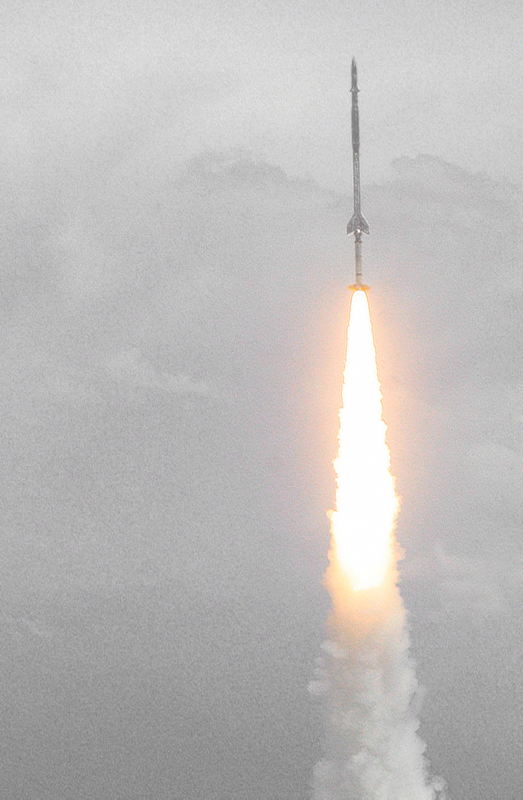 A sounding rocket launching for science research. deck: China’s un-manned AI subs. deck: Built for deep-sea science. 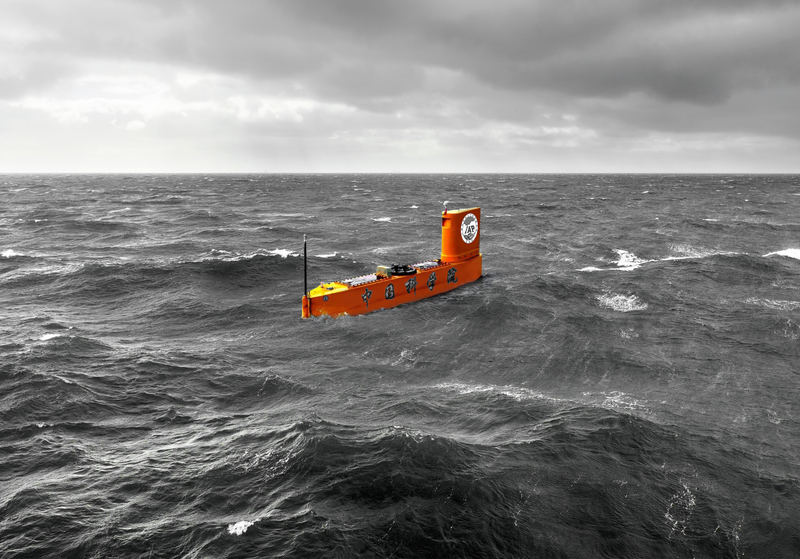 deck: The boom in robotics beneath the waves. deck: Humanity has only seen 9% of the ocean. deck: These X Prize challengers want to change that. * Shell Oil is under the umbrella of Royal Dutch Shell co.
* X Prize is under the umbrella of X Prize Foundation org. deck: Autonomous ocean travel with experimental equipment.